It’s all too common and all too easy for those writing about games to describe them as “A meets B and C”, or “the X of Y”. Video game criticism has still not matured to the point where we are comfortable describing new ideas without having to constantly refer to old ones. Worse yet, these references often rely on visual resemblance rather than on actual gameplay, leading many to pass up something original because it looks too much like something they’ve already played. As such, I would recommend that you resist the urge to write off Aliens Go Home Run as Breakout with baseball or some variation on that theme. ANIM•ACE’s sophomore effort is a fresh, energy-packed take on block-breaking, a game that tests your reflexes as well as your situational awareness. Design flaws hold it back, but AGHR is still a damn fine game, promising great things from its developers in the future. Aliens Go Home Run has a simple setup in the spirit of the retro games it has clearly taken its inspiration from you play Sally, a young girl who unwittingly starts a war with a hostile alien race when she hits a home run so hard that the ball lands on their home planet. Horrified, Sally decides to fight off the invasion on her own using nothing but her bat and ball. Sally’s liberation war will take her through 5 worlds, each divided into 10 mandatory levels and 5 optional levels, with boss fights on levels 5 and 10 of each world. 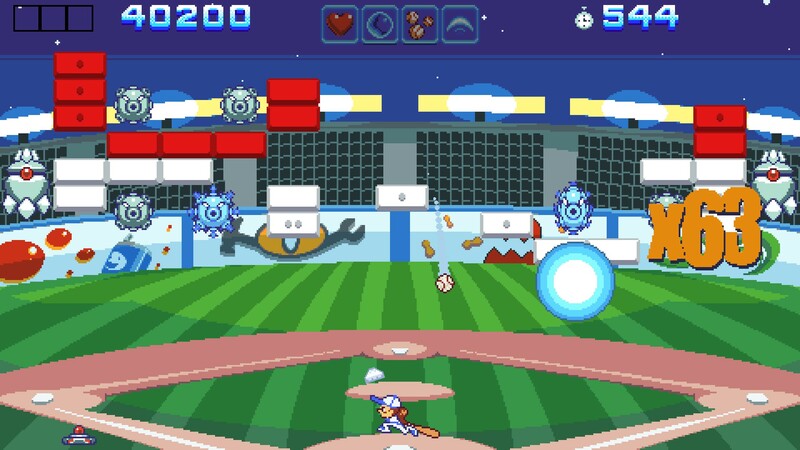 Beating a level requires clearing the screen of all blocks, which is naturally done by hitting them with your baseball. You are scored for your performance, and getting consecutive hits while keeping the ball of the ground will net you bonuses. Keeping up with the ball can be tricky, but Sally is also equipped with a slide, which, timed correctly, will cause the ball to shoot back up on impact. Adding to the challenge is the constantly increasing number of enemies on screen, all unique in their mechanics and endearing in their design. You will have little green critters firing lasers at you from mini-spaceships, Thwomp-esque enemies who will drop on you when you pass below them, and green slimes that will hold you in place as their buddies rail on you. Each world introduces new enemies, upping the ante and constantly increasing the number of threats you have to take into account. Thankfully, Sally is not unequipped to deal with these challenges. Her slide doubles as a dodge mechanic, making you invincible for its duration, and the same slide, along with bat and ball, can be used to damage enemies and eventually destroy them, giving you more breathing space until they respawn. Destroying blocks also sometimes causes power-ups to appear. These powers range from the more mundane, like healing or a protective barrier, to ones giving you an extra ball or allowing you to shoot energy beams upwards. Except for healing, these power-ups are not that common or that essential to getting through the game, but they are a nice touch. Aliens Go Home Run is a fun and fast-paced game, but later levels can get frustrating. The addition of enemy types does not imply the disappearance of old ones, and later levels will have your screen full of all manner of projectiles and baddies. This may sound like a fun challenge, but it forces you to constantly hammer the slide button in a mostly futile attempt to avoid hail after hail of bullets. Chaining slides is possible, but the timings finicky and unforgiving, making it more sensible to rely on health pickups than on consistent dodging. The optional levels are where things get truly out of hand. I only played the first world’s optional levels, and the rate of fire I had to deal with was so ridiculous that it actually caused frame stuttering – in a game that, pretty as it is, could probably run on a SNES. This is not to say that Aliens Go Home Run is a bad or unfair game. As you can see below, I quite liked it. But the strength of its ideas and visual design is not properly backed up with an understanding of how a difficulty curve should behave. Aliens Go Home Run is a fun and exciting game when it gets over the need to throw everything it has at you at once. When it doesn’t, it can be quite frustrating. Thankfully, the fun, arcadey gameplay has much more presence in the game than its limitations, making it a worthwhile title that is certainly more than the sum of its apparent parts.